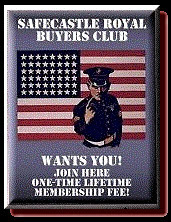 We are now making a very rare public offer of FREE lifetime memberships in the Safecastle Royal Buyers Club. The offer is good for up to 250 memberships, or through August 5, whichever comes first. - Then click "Checkout Now" in the right column. Go through the three-step checkout process (clicking the "Next" button twice after filling out the required info). - Wait until you receive an email that says your membership has been completed (we have to manually set you up for your discounts and incentives). After receiving that membership-completed email, you can log-in to the store and see your discounted pricing on our many preparedness-related listings. 7/28 Update: This may be the last call. Survivalblog posted this offer last night and we blew thru our 250 membership cap and then past our next added cap and now again we have upped our cap for the last time to 600 memberships. We may have to end the offer by tonight or sooner if the orders keep flowing in like they have been. 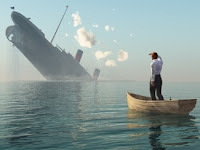 BTW, it's going to take a good long while for us to manually activate all these memberships, so your patience is appreciated. .
Nice piece on preparedness posted at Bob Livingston's Personal Liberty Digest. 1. Peace of mind. There comes a balance in life when one has a solid foundation of “life” insurance. Bad things happen out there daily, to some degree or another … from personal setbacks to community catastrophe or worse. Knowing that you personally are well situated for most anything life can throw at you means you sleep well at night–even when the headlines are at their most frightening. To say the least, folks who are at peace are not a problem for their neighbors or for the authorities. 2. Responsibility. Not only are folks who embrace readiness not a problem, they are often part of the solution when issues do arise due to natural or manmade disaster. But even before disaster strikes, citizens who put forth the effort to personally mitigate risks are also extremely likely to take their sense of community and responsibility to others and as citizens very seriously. They are often active and materially involved in initiatives of real value– politically, socially, commercially, and professionally. Labels: Cultural realities, Natural disaster preparedness, Why prepare? "This is Why We Fight"
Excerpt: Most revolutions, more revolts in human history have been about debt. It’s the most perennial tool that’s been used by people who are powerful to make the victims of structural inequalities feel that it’s somehow their fault. So I wanted to unveil that and show that we’re actually part of a very very long history. There’s also a lot of hope in it. Because the other thing I realized is that much of the world religions grew out of social movements, which were exactly about “problematizing” debt. Basically saying, who owes what to who? 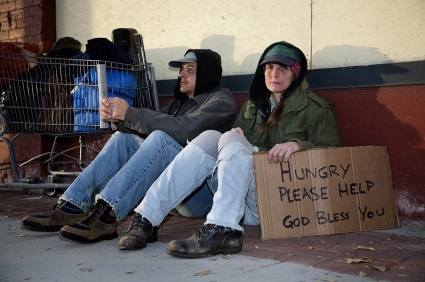 How Many Once-Middle-Class Americans Will Be Sleeping On the Streets Tonight? Excerpt: Economic despair is beginning to spread rapidly in America. As you read this, there are millions of American families that are just barely hanging on by their fingernails. For a growing number of Americans, it has become an all-out battle just to be able to afford to sleep under a roof and put a little bit of food on the table. Sadly, there are more people than ever that are losing that battle. Tonight, tens of thousands of formerly middle class Americans will be sleeping in their cars, even though that is illegal in many U.S. cities. Tens of thousands of others will be sleeping in tent cities or on the streets. Meanwhile, communities all over America are passing measures that are meant to push tent cities and homeless people out of their areas. It turns out that once you lose your job and your home in this country you become something of an outcast. Sadly, the number of "outcasts" is going to continue to grow as the U.S. economy continues to collapse. Do you feel the urgency? Get your bases covered in a hurry with Safecastle's own "7 Vitals of Survival" ... consisting of some of the most critical products we offer. Labels: Biological preparedness, Pandemic preparedness, Why prepare? 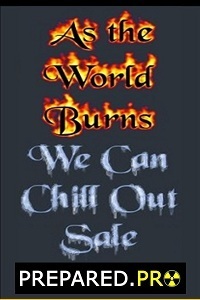 Safecastle's "As the World Burns Sale"
Does anybody really know what time it is? It seems to us to be very late. Smoke is in the air. Who knows what the night will bring. What we at Safecastle bring right now is a new sale opportunity with discounted prices on our replenished food packages, on our new Goal Zero portable solar products, and on Katadyn water filters ... necessities of the highest order. Also, we are temporarily doubling our Mountain House Royalty Rewards gift certificates to $100 for every three MH can cases purchased! Preparedness is largely about peace of mind. That's what we offer--the chance to be at ease, even when the world seemingly is ablaze. This is a very solid, data-centered approach, not only explaining the coming market crises but inevitable social upheavals as well. You can't be ready if you don't see it coming. Buchanan: "An Establishment in Panic"
Read this timely piece by Pat Buchanan. "... The Republican Party has not said it will refuse to raise the debt ceiling. It has an obligation to do so, and will. "The House has simply said it will not accept new taxes on a nation whose fiscal crisis comes from overspending. "If the GOP keeps its word, raises the debt ceiling and accepts budget cuts agreed to in the Biden negotiations, the only people who can prevent the debt ceiling's being raised are Senate Democrats or Obama, in which case, they, not the GOP, will have thrown the nation into default. "It is the establishment that is resorting to extortion, saying, in effect, to the House GOP: Give us the new taxes we demand, or Obama will veto the debt ceiling and we will all blame you for the default. "The GOP should stand its ground -- and fix bayonets." In the spirit of the holiday--Independence Day--please enjoy this short, restored film of the spontaneous celebrations erupting around Honolulu when WWII finally ended.